All too often, children lose the small pamphlet of Bionicle building instructions that come with these Lego brand toys. If you find yourself searching frantically for those instructions, look no further because there are opportunities to replace them online. Whenever people think of Lego, they often think of the legacy of building blocks that the toy company founded itself upon. Many adults remember those simple building blocks from their own childhood. However, many people don't realize that the toy company was financially at an all-time low in 1997 when it posted a profit loss for the first time in its history. The overwhelmingly popular Bionicle series was born from the company's efforts over the following decade to reverse that troubling trend. Many adults today remember being very small and receiving that first Lego set. The blocks of various sizes and colors would snap together to form exciting and new creations. These building sets came in kits that included building instructions, much like a model, but no modeling glue or skills were required. Through careful focus and attention to detail (and following the instructions very closely), a small child could create an impressive castle or a spaceship in several hours. Playing with these self-built Lego toys involved the child formulating a story with his or her imagination and then pretending that the toy played a central part in that plot. It was enough to keep the children of the 1980s and 1990s occupied for hours. However, throughout the 1990s, as children's media in film and on television were transformed by computers and technology integrating every aspect of family life, children started expecting the same sort of technological theme in the toys that they wanted. By 1997, Lego's lack of innovation and inability to keep up with this social trend became apparent in their profit loss. The following series of events represents how Lego finally started making moves to innovate and update their product offering, leading to the Lego Bionicle line of toys. Lego entered a license agreement with Lucasfilm in 1998 and started offering a Star Wars line of Lego toys. This new line became an instant hit. Following along with the theme of technology, Lego introduced RoboRiders the same year. However, sales were not impressive, and through this failure, Lego corporate leaders started realizing that in order to achieve success in this new era of the toy industry, children needed a storyline to attract and keep their interest. In 1999 and 2000, Lego developed a story of their own and built the Bionicle world, heroes and villains from scratch. In 2001, Lego introduced the Bionicle line in Europe and it was a major success. 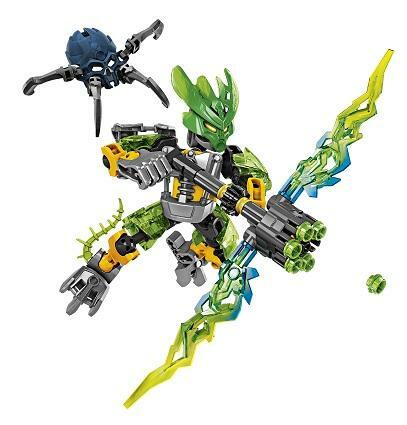 The same year, Lego distributed Bionicle in the United States with the same positive response from young consumers. In 2003, Lego cooperated with Miramax Films to create a brand new movie called Bionicle: Mask of Light. The storyline of this movie is the direct storyline created by Lego for their Bionicle toys, and represents a somewhat new era in movie making where movies are based on new toys, rather than the other way around. As with most popular toys, the earlier styles and models become very collectible. Additionally, many children like to go back and recreate the older models all over again, but often the paper instructions that came with the toys get lost. Luckily, parents have a few options when it comes to replacing those instructions. Bionicle Website - If the Bionicle set is fairly new, your best bet is to check the official Bionicle website where you'll find free instructions for all of the newest figures. You can choose by category, including Glatorian, Agori, Vehicles & Creatures and more. Manuals Mania - Another very popular site for free manual downloads is Manual Mania. If you search the site for "Bionicle," you'll find a long list of building instructions that are all free to instantly download. Lego Building Instructions Archive - This search page on Lego's website is the best place to search if you've lost the instructions for any of the older Bionicle sets. The library has over 3300 building instructions that date all the way back to 2002. If you've searched through the free sites and still can't find the instructions for your particular Bionicle, you may want to consider searching the sites below. These are both resources where you'll find sellers offering a variety of Bionicle instructions, including the very old sets that are somewhat hard to find. Brick Link - This very popular "unofficial" Lego marketplace features millions of Lego items, and almost always has Bionicle items available. This website is like the eBay of Lego products, and your best bet to find rare instructions is to start here. eBay - Speaking of eBay, the most popular online marketplace is an excellent place to find rare and hard-to-find items. It's an excellent resource to search for the document you're looking for that you can't find anywhere else. Bionicle building sets are very much based on the instructions that come with them, so it's especially important to protect those instructions. Without them, the toy is only useful if the child playing with it is willing to produce his or her own creation. However, if the child wants to build the original model the way it was intended, you'll need to locate those instructions using one of the resources listed above.